The award-winning Focusing Cyc is a lightweight, compact luminaire designed to provide an even wash of light on cycloramas and backdrops. 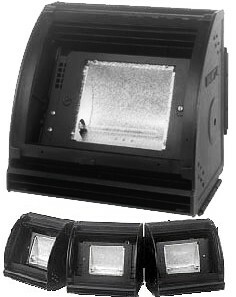 This lighting instrument can also be used as a multi-purpose flood/fill light for stage and studio lighting applications. The Focusing Cyc has been designed and engineered with a number of innovative details and features that enhance its versatility, efficiency, and performance. Each compartment has a state-of-the-art, highly polished and peened reflector that pivots about the lamp for precision focusing. The housing features a pair of rugged tool-free spring latches which allow multiple units to be safely locked together in a number of ways: straight row, curved horizontally, curved vertically, or any combination of the three. The convenient, fold-down carry handle also doubles as a loop for a safety cable, and the heat- resistant non-skid feet are height-adjustable, eliminating the need for floor trunnions for most ground-row applications. A wide selection of yokes and other hanging hardware is also available to accommodate virtually all overhead mounting configurations. The Focusing Cyc has a 20 Amp Bates connection and it can be sent out with a 20 Amp Bates to 20 Amp Edison adapter.